I've always admired bead embroidery, but never really taken the time to play with the medium. Christine and Therese's announcement back in February that their next Time to Stitch Blog Hop would focus on Bead Embroidery seemed like the perfect excuse to give it a whirl. I even had the start of a little project that had been hanging around for a while - a little bead embroidered oak leaf I'd started some time in the past. I thought I'd finish it, then move on to something larger. 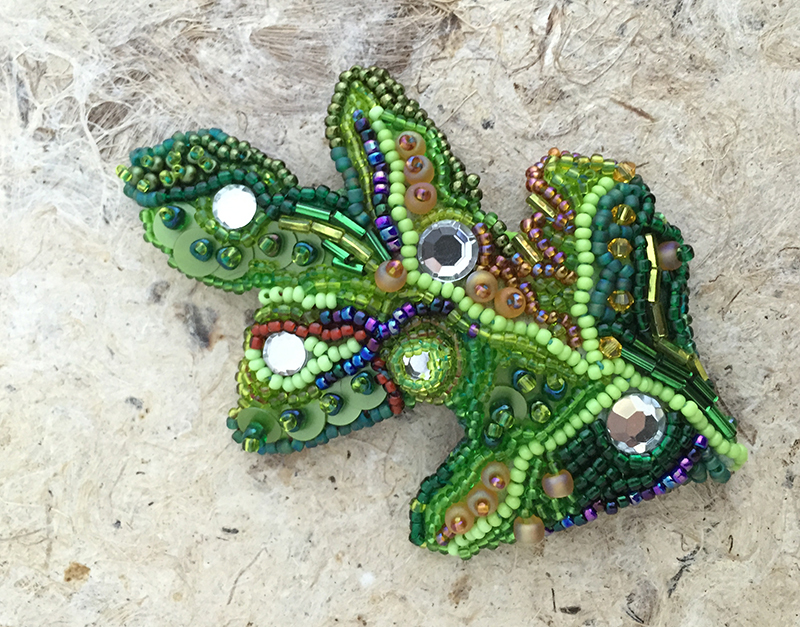 My goal with the leaf was simply to try out lots of different ideas, stitch combinations, and types of beads. Some worked better than others, but I think it's quite cheerful, and was a lot of fun to work on in the dead of winter. Then came a long lull, with not a spurt of creativity in sight. I was definitely caught in the creative doldrums. As the days and months sped by, I started to wonder if the leaf would be all I had to show for this blog post. Then my dear friend Georgia McMillan came to my rescue! Georgia brought several of her wonderful "Happy People" bead embroideries to the May Seedbeaders' meeting. Better yet, she graciously allowed me to take photos to share with you (I'm including two in this post). Thank you Georgia! I spent a couple of days studying the photos and thinking about her work. 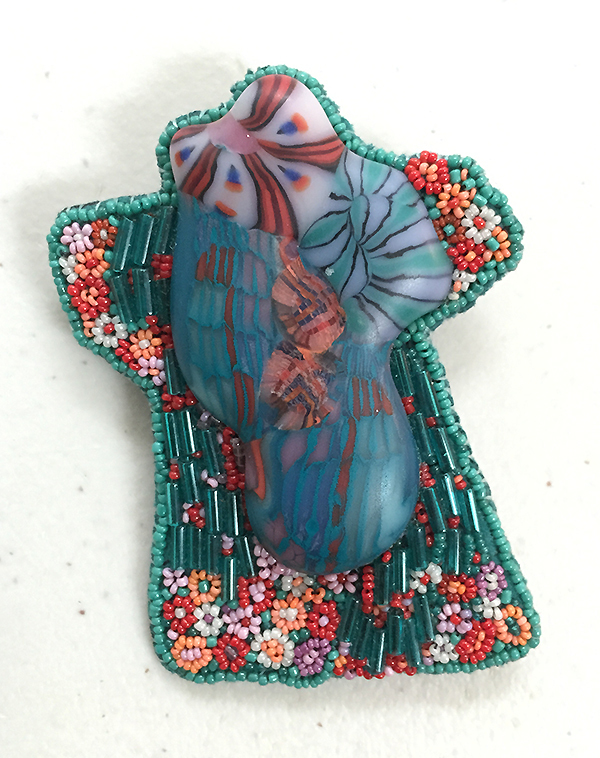 This more abstract design uses size 18 beads in the flowers! Her Happy People are small - the largest easily fits into the palm of my hand, so I'm guessing maybe 3 1/2" tall, tops. But the details are incredible. I loved their size, I love Georgia's sense of whimsy, I love her attention to detail. I contemplated making my own Happy Person. But I feared that I'd simply be copying Georgia if I did, and wanted to do something more 'me'. So I decided to sleep on it. Can you guess where I decided to go with? Fish! Big surprise, huh? I figured I could surely I do something with fish. 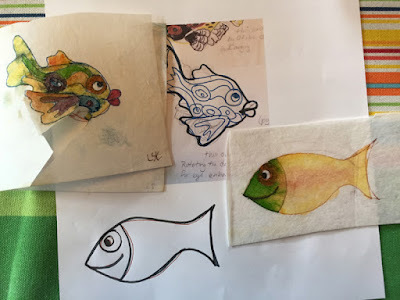 I've made right angle weave fish, and freeform peyote fish, but I'd never made a bead embroidered fish. So it was about time! Time to pull out the sketchbook. I pulled several ideas from my sketchbook, including these two above. I love the curves and lines of the top fish, but feared she was too complex. I wanted something simpler to use as a 'blank canvas' for more exploration. The bottom fish is about perfect, complete with a lovely, cartoony smile. Transfering the design to interfacing, it was time to start stitching. I totally blame the sequins on Sarah of Saturday Sequins. 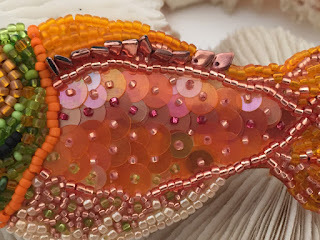 I'd never even considered using sequins in my beading before seeing her work. These days, sequins keep showing up in my designs (they are really sneaky that way!) In this case I thought they'd make great fish scales. I ended up using five different colors of sequins - three transparent and two opaque. My first Happy Fish - poor thing doesn't even have a name yet! Like the leaf, I didn't have any specific plans for where I was going, other than the two large blocks of color and wanting to use sequins for fish scales. I added in some of Georgia's 'flowers' along the bottom of the fish, using 15s. Because I had just purchased them, I added a line of dragon-scale beads towards the top of the body. 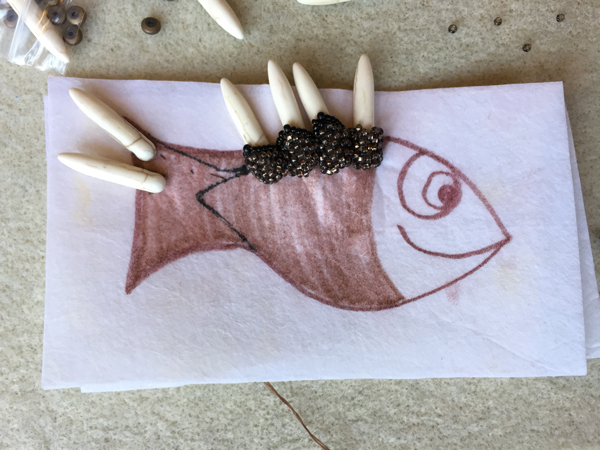 Originally they laid down in a nice, flat, spiky row, but I decided I wanted more dimensionality and added a line of beading under their tips to make them sit up from the background. Not sure it was the right choice, but hey, it was fun to experiment. Here's the start of my second fish - this one's going to have spikes! Oh, and if you have a name suggestion for my little friend, let me know. If I like it, you just might claim naming rights! It has me craving more sequins in lots more colors! I'm still not a huge fan of the cupped sequins. But I am loving the flat styles. Thanks for trying again when the first comment didn't take. Sometimes I really don't know with technology. I had no idea you were not an embroiderer. I thought for sure you were! The oak leaf is a beautiful first time piece, but the fish and the start of the spike fish!!! Oh yes ~ these are wonderful!!! His underbelly and his "scales" are fantastic, as is his adorable face! Thanks for bringing our attention to Georgia's Happy People ~ what works of art they are! Gorgeous! Beautiful. Precious. Strong. Thanks for signing on to this one, Karen! 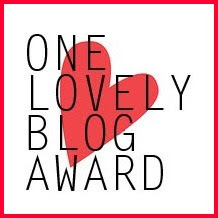 You are always one of my favorite blog stops. 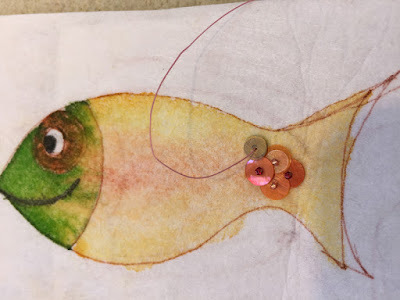 I started out as an art quilter and a thread painter (using my sewing machine with the feeddogs down to paint with needle and thread), and I added beads to my work. 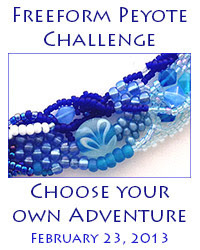 But never thought of what I did as "bead embroidery". To me, that was where you cover the surface entirely in beads. I'd always shied away because it seemed too regimented, as most of the patterns I'd seen seem so focused on exact counts, and well we all know that's not me! This challenge and hop has really helped me see how wide open bead embroidery is to interpretation. I love where you went, Happy Fish! They are exactly that such beautiful whimsical little happy fish! The oak leaf is pretty awesome to. I have wanted to do a goddess for some time, Georgia's Happy People have given me new inspiration. Thanks for sharing! Georgia's work always makes me smile. She is such an amazing woman. One of the amazing synergies of artists is how we can inspire each other in our own work. So great that you chose a happy fish as your subject. And a wonderful subject he is.... if he is a he..... And thanks for introducing me to Georgia's happy people. 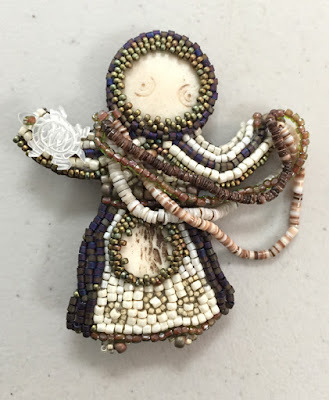 I was not familiar with them and just love little beaded characters like that! I think you definitely got back your mojo! 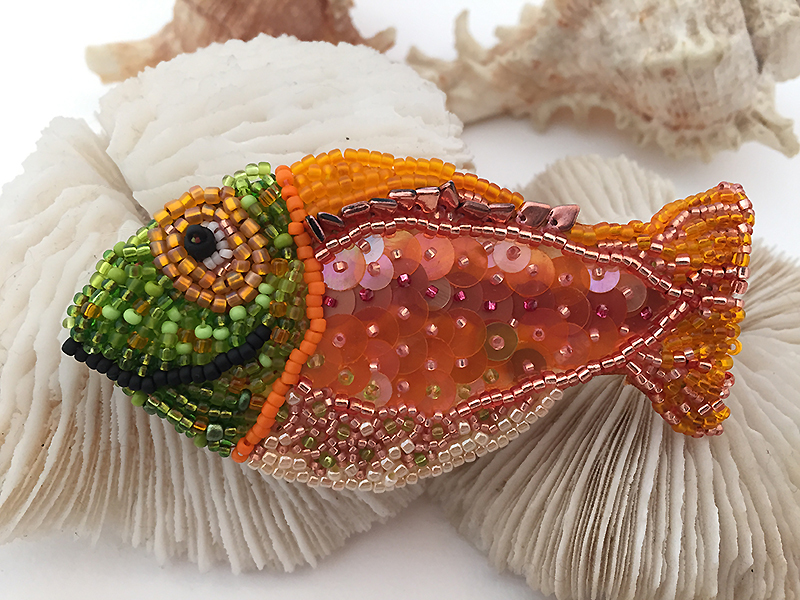 Isn't it great when our beady friends can inspire creativity? 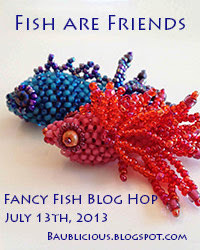 I love this newest entry into your fishy creations! 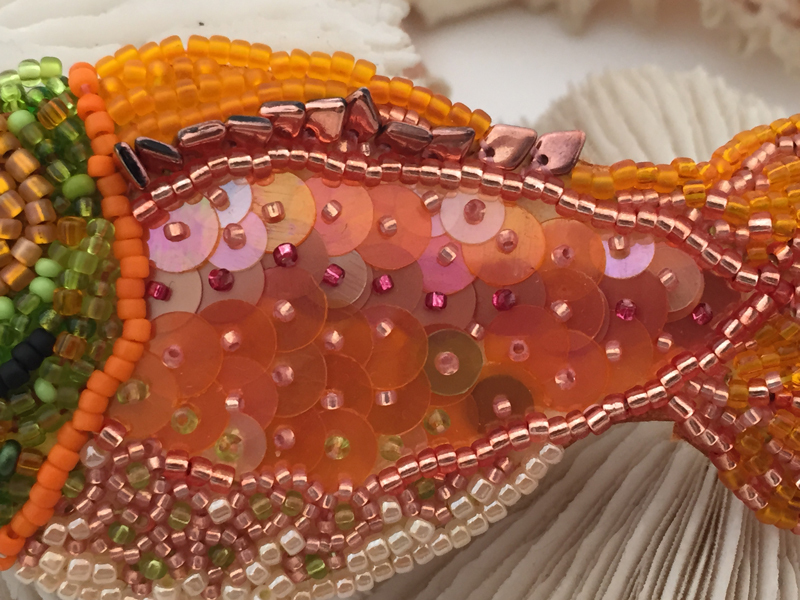 The sequins are the perfect way to capture the iridescence of scales, and it is a cheerful little fish of beautiful watercolor shades. Perhaps since Georgia's happy people inspired you down this path, you should name the fish Georgia (or George, if he's a he). And I can't wait to see Spike when he's finished! I love your pieces they are both beautiful. The leaf has so much going on in the design that I notice something new every time I look at it. Georgia's happy people are adorable and so is your fish. When I saw it the name Sammy came to mind. I guess because of the colors you chose to use. He/she is a very happy little fish. Spike is going to be an awesome fish when he is finished. Thank you for participating in ATTS 7 and I hope that you will join in on ATTS 8. Sammy would be a great name, except then my nephew would think I named it after him! 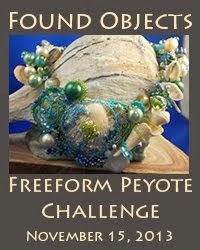 :) Thanks again for hosting the challenge Therese! The fish is so totally you, Karen! Love him!! and his grin!! Could definitely see doing something wonderful with the top design in your sketches as well...blues and pink and maybe a bit of orange. :-) Spike is looking awesome as well..looking forward to seeing him completed. Both your leaf and your fish are wonderful! I find it hard to believe the leaf was a stitch testing ground because it came together so well. It sings "spring" in a delightful way. 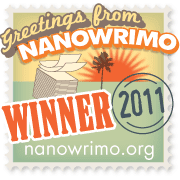 I also corrected the link for your blog on my page. I don't want anyone to miss this! I think you read my mind! I don't see how I can possibly stop at two Happy Fish! They simply wouldn't be 'happy' in such a small school. I've continued working on Spike, and keep coming up with other things I want to try. Love your leaf and your fishies. I suggest Gilbert for a name for your sequin fish (pun intended). I love where you are going with the next fish too. Wow, love the fish! I too think Gilbert is a perfect name! And the leaf, I think in a mixed media "picture" would look great with Gilbert swimming in the bottom! Thanks for sharing with us! Karen, oh my gosh!!! These are fabulous pieces, and I am thrilled that you used sequins. Would you mind if I featured them on my blog sometime? Also, since you seem to enjoy bead embroidery, I have a book idea you might like. Let me know if you're interested! Hi Karen, Your leaf is beautiful.Your happy fish is so you and he is adorable. The sequins make perfect scales. I am glad to see that you have more fish in the works. I had no idea that you had not done bead embroidery before. It can be as freeform as you want it to be .